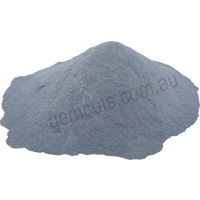 Tumbling grit is a silicon carbide powder that is much harder than the types of rocks that are commonly tumbled. When it is caught between tumbling rock particles it creates tiny scratches on them. This continuous scratching wears down the rocks and rounds them. Sharp edges on the rocks are worn down more rapidly than flat surfaces because the grit is rubbing against them on two or more sides. The result of this grinding is smaller, rounded rocks. There are different types and sizes of tumbling grit. If you bought a rock-tumbler kit, then you will be using what’s provided for your first batches of rocks. After that you will need to purchase the needed grits. We provide the grits individually or as a grit kit. We provide a much wider range than those listed above. This is because some people prefer coarser grits to shape rough stones more quickly, and othe people prefer to use finer grits prior to polishing. The four steps listed above will cater for most circumstances.